It can be tricky to come up with a thoughtful gift for someone on Valentine’s Day that we know will be appreciated but is still practical and shows some creativity. One great idea is to present your loved one with a brand new phone! 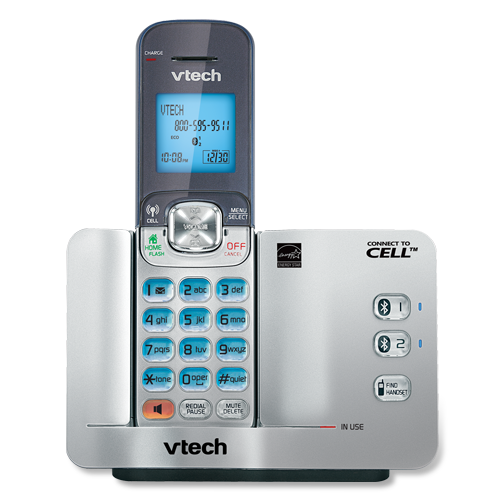 Whether you are dealing with distance or you just want to stay better connected with them, a new phone like the VTech DS6511-15 Connect to Cell (MSRP $39.95) might be perfect! This phone pairs with mobile phones using a new one-button setup feature so you never have to deal with bad service or a dropped call again! How sweet is that? Make and receive landline and cellular calls-Connect to BLUETOOTH®-enabled cellular phones to make and receive cellular calls with the ease and comfort of a home phone system. Avoid the mad dash to catch your cellular call before it goes to voicemail. Store 200 directory entries from up to 2 different cell phones- Store 200 records from up to two different cell phones; no need to input names and numbers into your cordless phone system. ECO mode power-conserving technology-Power-conserving technology manages consumption for optimal battery performance. Quiet Mode -Silence the ringer on the handset and base unit immediately, or for an extended period of time. Look for the phone within the Connect to Cell line from Vtech at major retailers including Walmart and Target and online at our affiliate Amazon or directly from Vtech. I have a VTech DS6511-15 Connect to Cell phone for one of my lucky readers in celebration of Valentine’s Day! Disclosure: I received no compensation for sharing this giveaway with my readers. However, look for a review from contributing writer Janelle coming soon for another Vtech phone! Originally published on 2013-02-14 by Emilie at Baby Loving Mama .